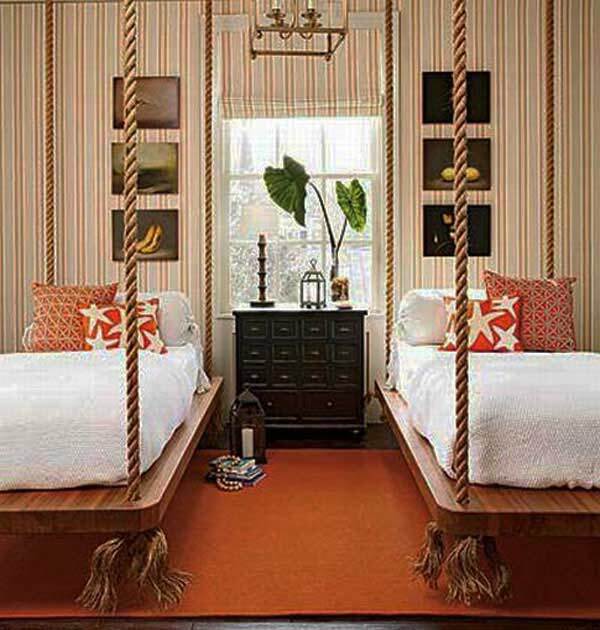 Here are our 30 Cool Bedroom Ideas that will let you get inspired for your bedroom design. 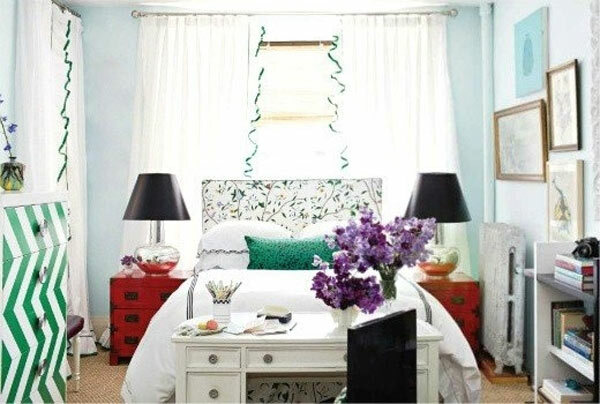 Which one below is your favorite bedroom design? 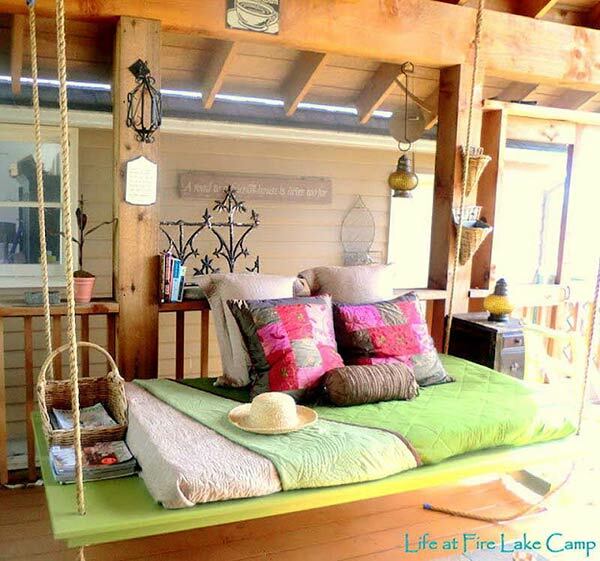 Swing bed? wooden pallets bed or bed on lockable casters? 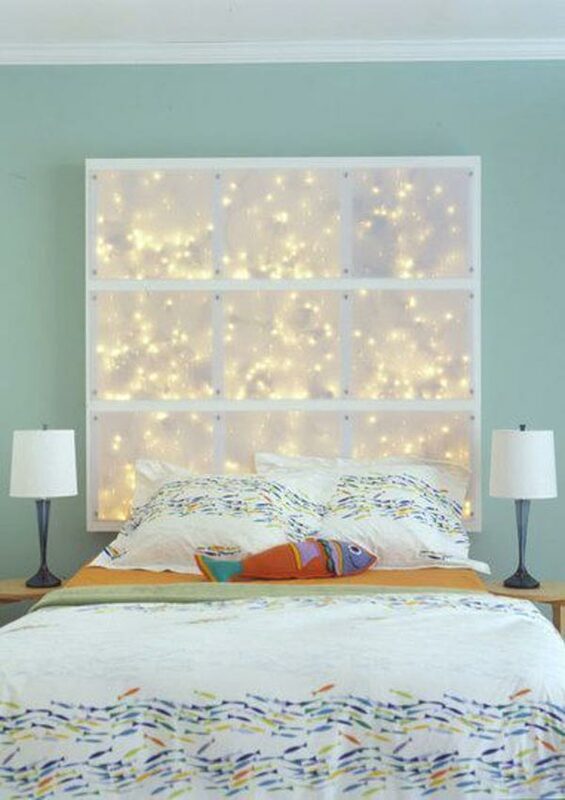 1 | Set your bed up against a wall so you can prop pillows up when you need to use it as a couch. 2. 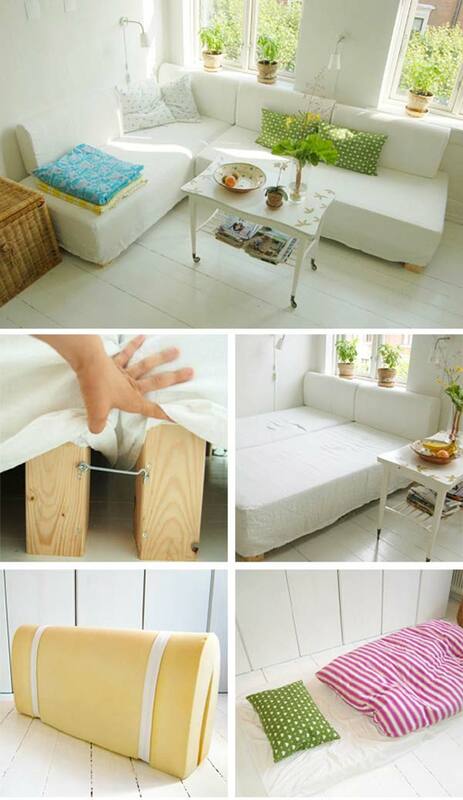 Make a couch that swivels into a bed. 3. Pull-out tray under the bed. 4. 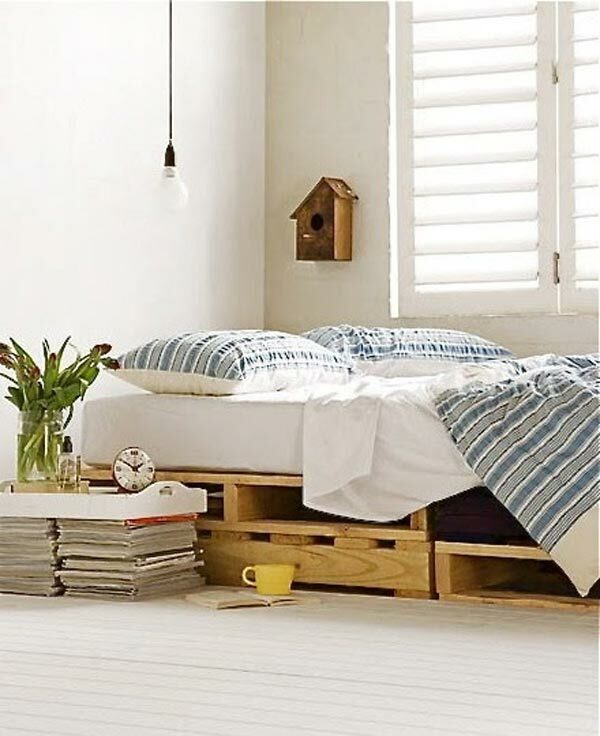 DIY Bed from wooden pallets. 5. 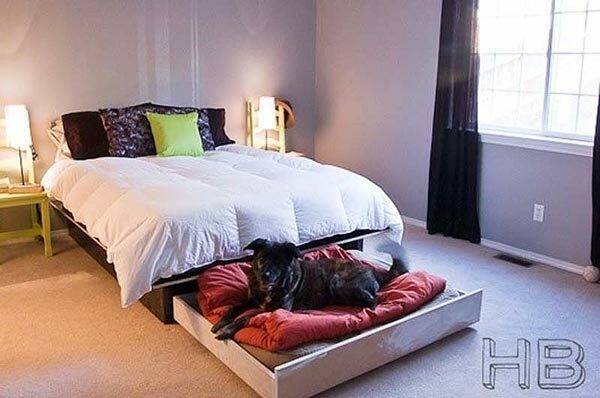 Perfect bed for your dog. 6. Turn old drawers into stackable shelves. 7. A chest doubles as a coffee table and as storage. 8. 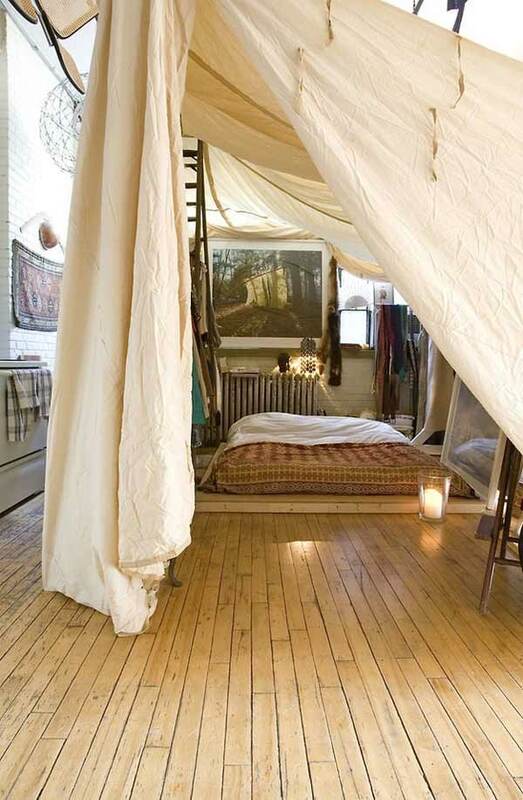 A bed suspended on a rope. 9. 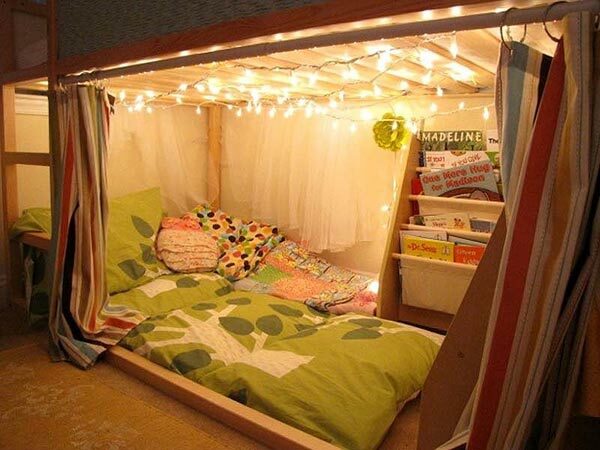 Put the bedroom under a gigantic canopy. 10. 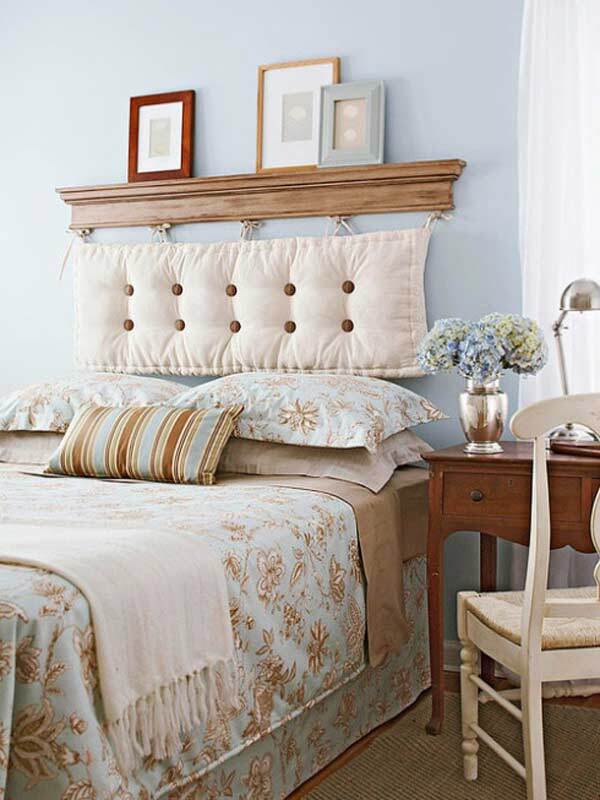 Integrated shelf in headboard. 11. Instead of a footboard, use your desk. 12. 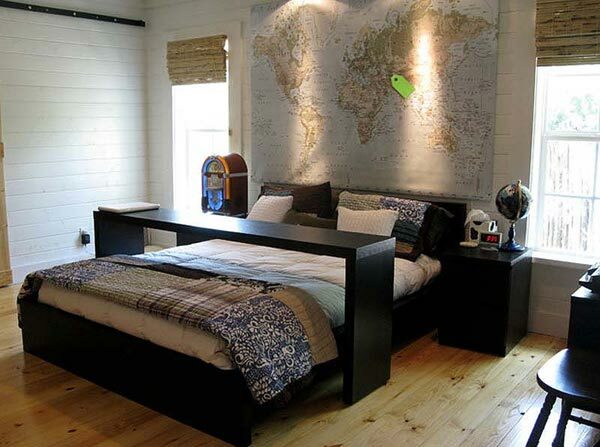 Can stack up pallets to basically make a platform bed with cubby holes. 14. 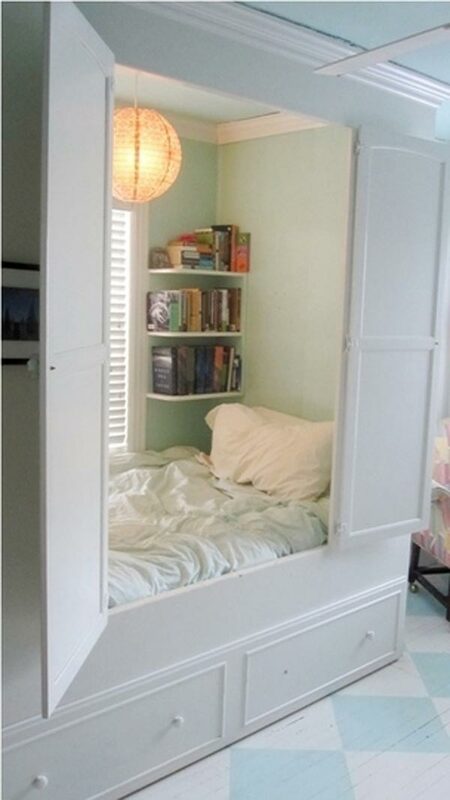 Tuck your bed into an alcove. 15. 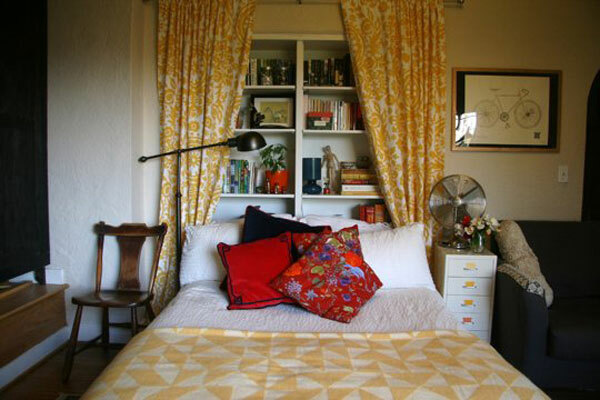 Hang your lamp, so you can either skip the bedside table or keep your table space free. 16. 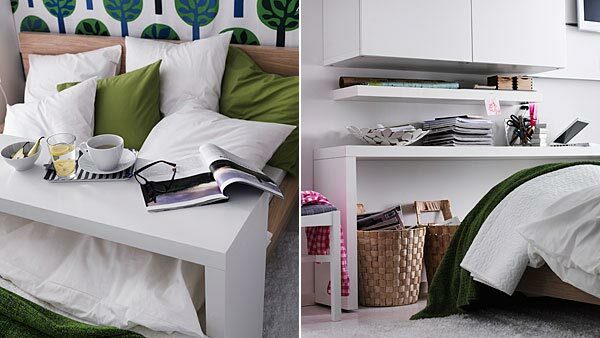 Get a console table for your bed that doubles as a shelf and a desk. 17. 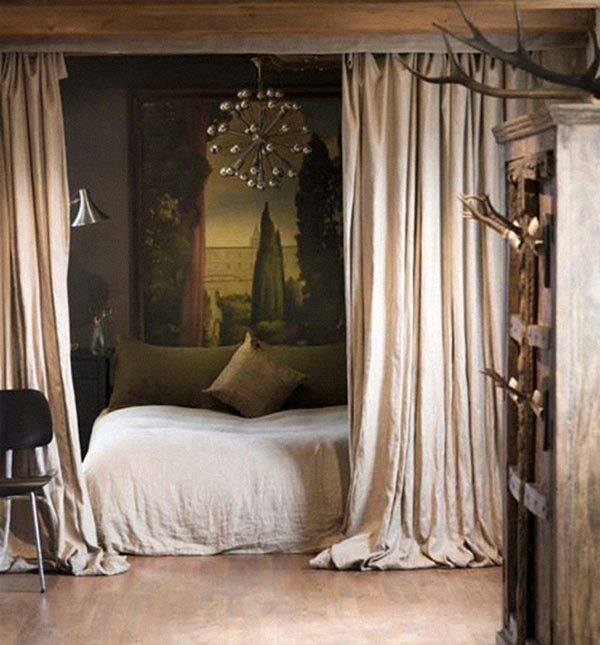 Place a curtain around the bed. 19. 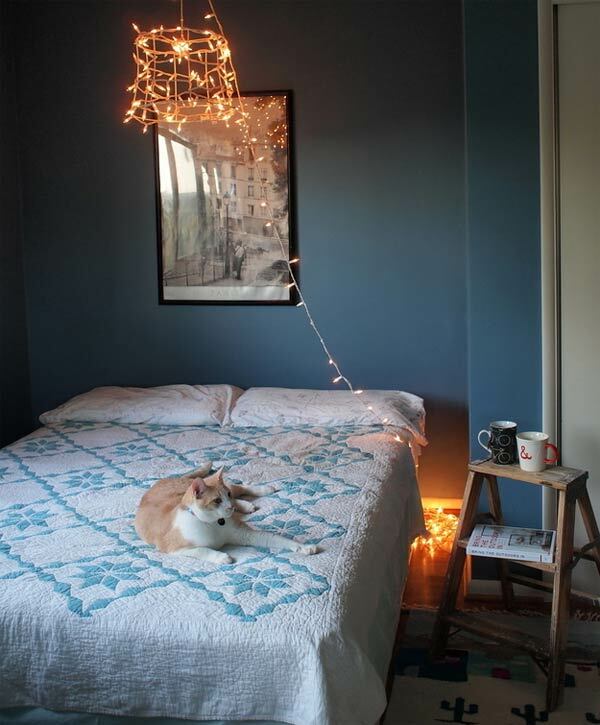 String Lights In The Bedroom. 20. 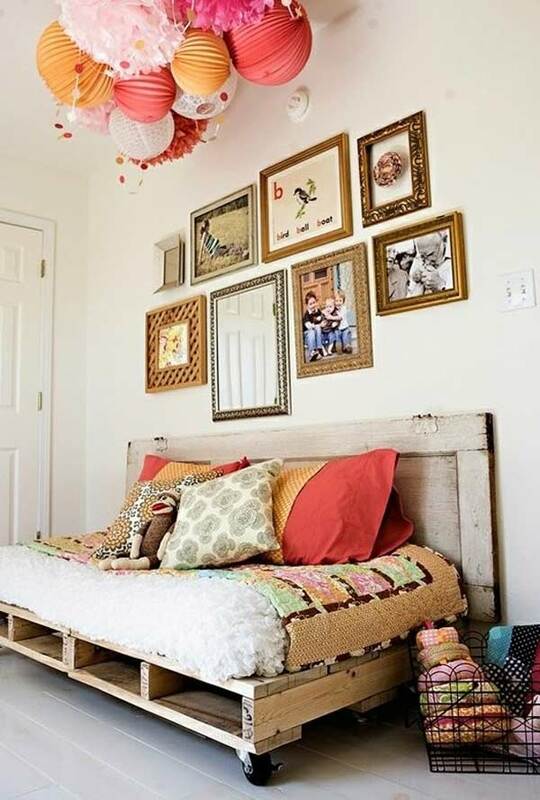 Wood pallets + casters = fabulous bed frame! 21. The bed in the “box”. 22. 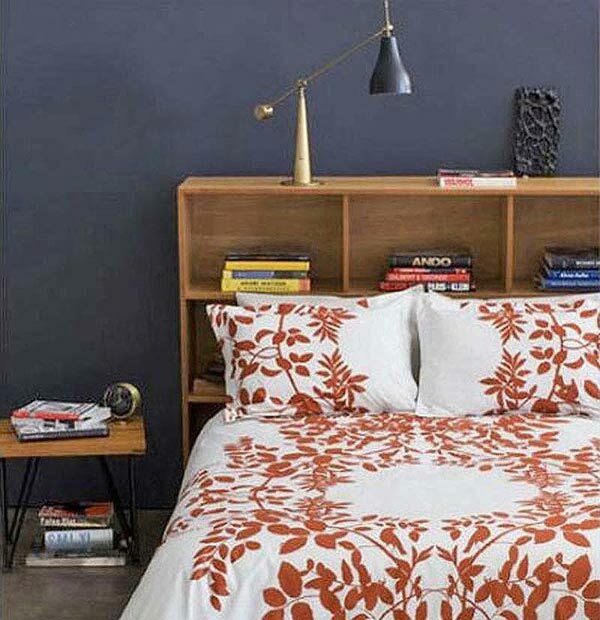 The bench at the end of the bed looks like two old thrift store find end tables, circa 1950 ish. 23. Its very romantic in an otherwise normal setting. 24. 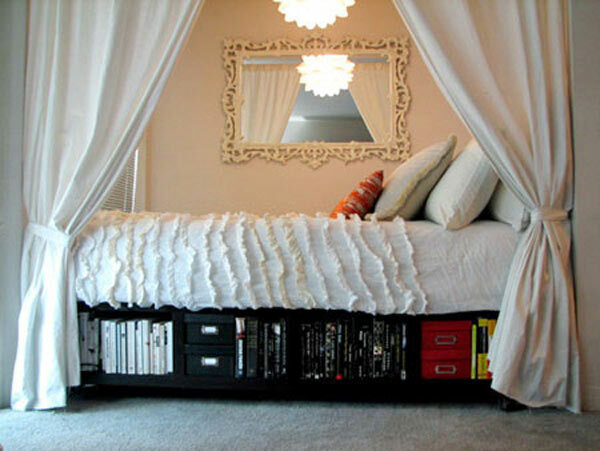 Bookcase as a headboard. 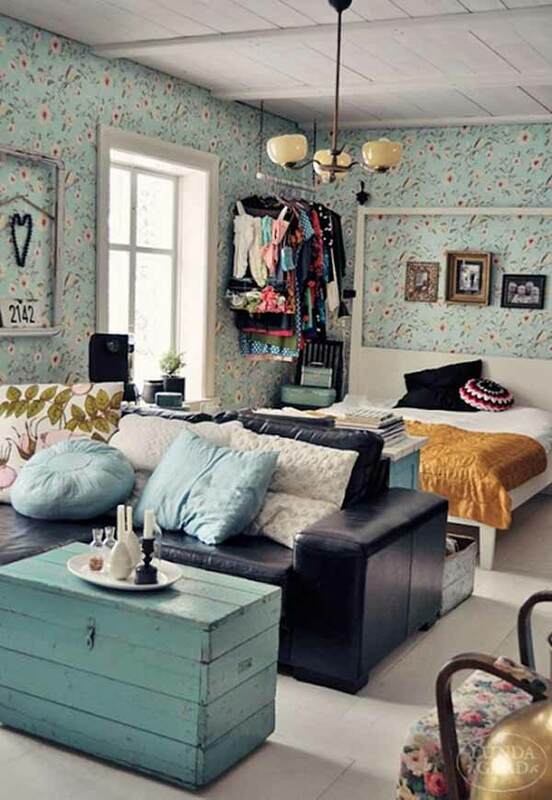 great for a small room. 25. 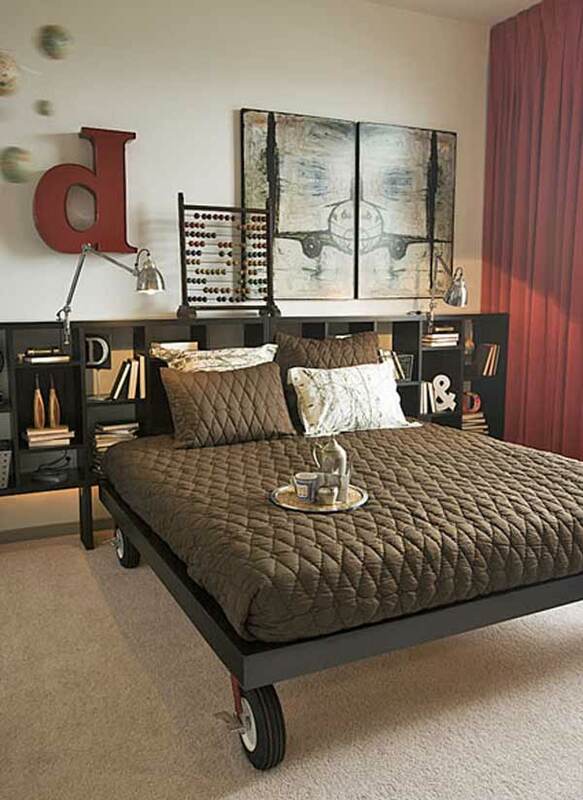 Cool idea-tufted cushion as a headboard. 26. Put your bed on lockable casters. 27. The bed in the closet. 28 | Mattress on the floor. 29. 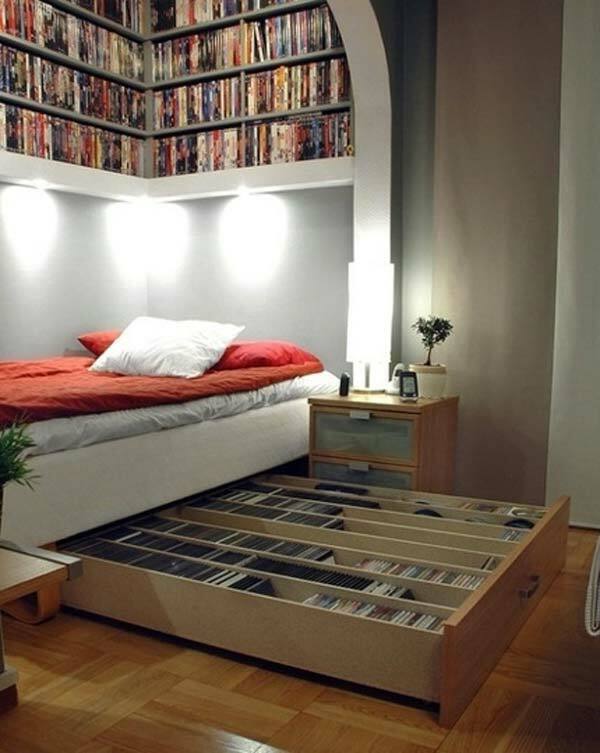 Hide a shelf behind your bed. 30. 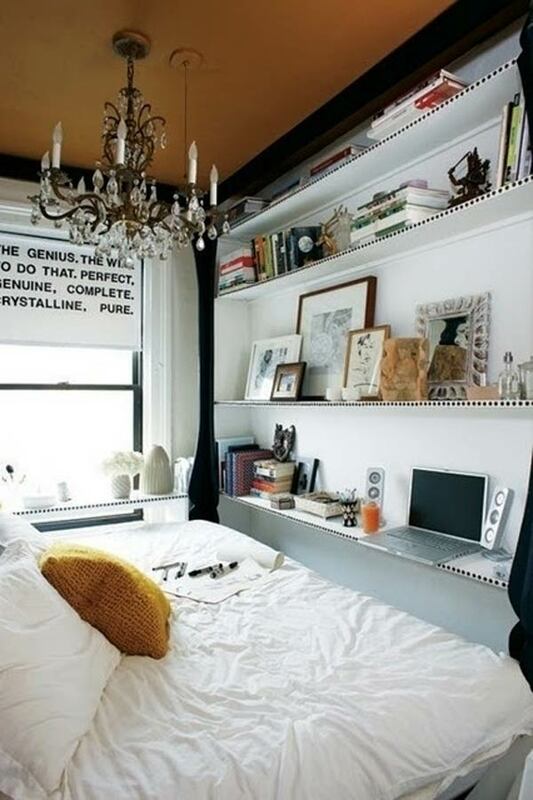 Use a bookshelf instead of taking up space with a desk.